So when the opportunity came up to go to Heron Island at the end of September with our little family, we packed our bags and made our way to Gladstone from where we would get onto the �Heron Islander� to drop us off at the Heron Island Resort jetty. Instead of taking the boat you can also opt to arrive by helicopter. This is a great way to experience a 30-minute scenic flight with amazing views of reefs and coral cays. What a spectacular way to start and/or finish off your holiday! Heron Island is a coral cay and is located on the Southern tip of the Great Barrier Reef, almost 90 kilometres off shore from Gladstone, Queensland, Australia. The island itself can be circumnavigated in about 30 minutes on foot. As the reef is close by, all dive sites can be reached in 15 minutes or less. Easy snorkelling can be done right off the beach. The Heron Island Resort can hold up to 200 guests and 100 staff and is located on the northwestern side of the island. There is also a Research Station on the island as well as a permanent Ranger Station. Even though we visited during school holidays and the resort was catering almost to capacity at no time did it feel crowded or too busy. Going on a (dive) holiday is definitely different as a family. 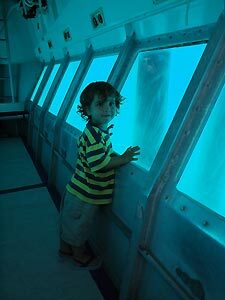 A live-aboard for example is not an option with young, non-diving children. And when they are older they might also want to join in the fun (read: expensive) or maybe they have no interest at all to participate and only want to hang out with their peers and chat how boring we are. Since we had our first child almost three years ago things have changed a little on how we go on holidays and especially what we bring. Trains and cars, puzzles, books, nappies and wipes, emergency food supplies and a basic first aid kit complete with child-strength Panadol and Wiggles Band-aids have replaced my dive gear for now. This time I did manage to remember to pack a mask and snorkel, but forgot about fins. Wetsuit was left at home as I knew I couldn't possibly squeeze my 7-month pregnant body into it. This was reflected in the diversity of people we saw and met whilst being there. From young families to couples of all ages - all obviously enjoying their time at the resort. We can�t wait to share our passion for the marine world and nature in general with our children that�s for sure. And our almost three-year old was pretty much excited about anything we undertook during our four day stay and kept telling us: �I am SO lucky!�. 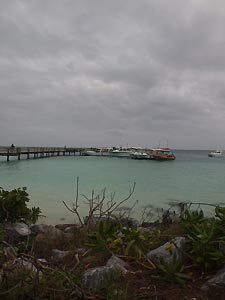 �The more than 20 dive sites are all very close to the island and no long boat rides are necessary. All dives are single boat dives and you can do a maximum of three dives a day. 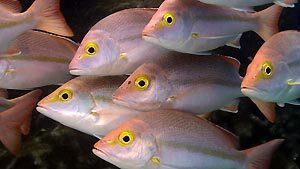 Night dives are organised on a regular basis as well. About 72% of the coral species found on the Great Barrier Reef can be found around Heron Island with the Acropora genus being well represented. Besides all the coral species plenty of fish and invertebrates can be seen. 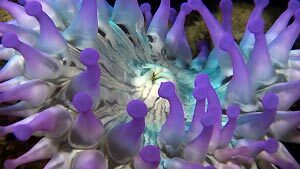 A colourful combination of Anthias, Parrotfish, Surgeonfish, Anemonefish, flat worms, nudibranchs, sea cucumber and sea stars has turned the reefs surround Heron a busy, yet relaxing place to visit. Turtles are around all year, but obviously at mating and egg-lying times (November through to March) their numbers increase dramatically. 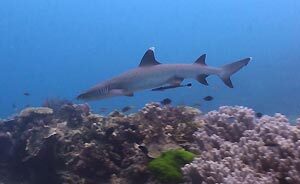 Divers and snorkellers will see at least some sharks. 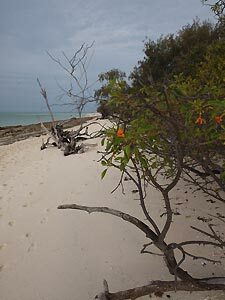 The shark species living around Heron Island include White-tip Reef Shark, Black-tip Reef Shark and Lemon Shark. 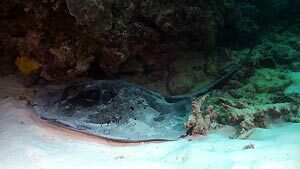 Their close relatives the Eagle Rays, Cow-tail Rays and Shovelnose Rays are very common as well. 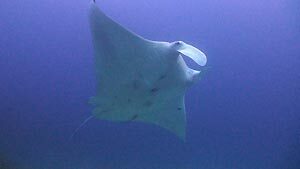 Manta Rays are also regularly seen and apparently the best place to encounter them is Pam�s Point. Unfortunately, the weather we experienced meant that only one side of the island could be dived, but nevertheless Tim enjoyed his time under water. 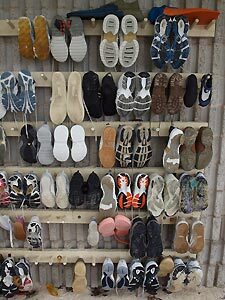 He noticed that there were quite a number of different species of anemonefish. There are several snorkel entry points around the cay and depending on tides and surface conditions different sites are recommended on different days and times. Snorkellers have the opportunity to swim with rays and turtles and different kinds of sharks, including White-tip Reefshark, Black-tip Reefshark and Lemon Sharks. If you are a more confident snorkeller you can also book yourself on one of the snorkel trips by boat, which will take you to the edge of the reef. Our Beachside Suite was very comfortable. As the bedroom area was cleverly separated from the (small) living area by a sliding door, we were able to relax, do some more reading, play board games or even have a conversation once our child was vast asleep in his port-a-cot � provided by the resort. I must admit that a couple of nights I went to bed not long after Mr Toddler and thoroughly enjoyed falling asleep to the sounds of waves lapping on the shore nearby. Unfortunately, we weren�t blessed with the most perfect weather and we had regular showers throughout our stay. 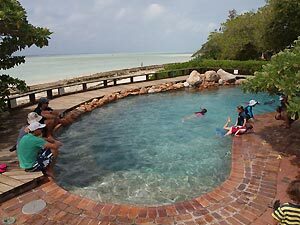 However, as soon as there was a break in the rain we managed to explore the island, have a swim or snorkel and make use of the number of activities the resort has on offer. My husband a.k.a. dive buddy was lucky this time around as I obviously couldn�t go diving due to being pregnant. Tim would do the two morning dives and be back in time for lunch. I made myself useful though and saw the opportunity to spend some relaxing time with our son without having to worry about ANY daily chores or work. Typically, Mr Toddler and myself would wander down to the beach to start our day after breakfast. It was great that the resort provided buckets, spades and the like as we had forgotten ours at home. While he was playing in the sand and looked at shells, sticks and coral fragments, I was able to do a little reading or just gaze across the water and occasionally admire his finds. 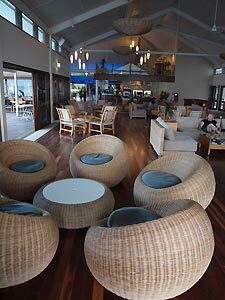 Afterwards we would have a quick coffee at the Pandanus Lounge and then venture closer to the pool. From here you can look out over the water. We saw Humpback Whales breaching from there and later in the day, just before sunset, sharks and turtles come in close. This is a great location to go snorkelling at the end of the day. �Visiting the pool made me realise there was an advantage to travelling with a toddler as I would have never gone into the reasonably cold pool voluntarily! Okay, I�ll be honest: at first I envied the parents that were coaxing their older and more independent off-spring to g o for a swim by themselves while they were lying on the comfy deckchairs enjoying their coffees and books but after the initial 30 seconds it was great to be floating and swimming, occasionally throwing our toddler around a little and feeling all invigorated afterwards. �I was also particularly proud of my son splashing happily in the pool and putting his head under water looking for �Nemo�, whilst a father vehemently tried to convince his kids take a lead from the �little boy� and try out their snorkel sets, which they refused. Other things to do are the very informative, guided Reef Walks and Bird Walks on offer every day at no charge, but with an almost three year old with a limited attention span for adults who are talking about all kinds of interesting things we could only do short bursts of looking at the life. The seacucumbers with their outstretched tentacles were a hit though. 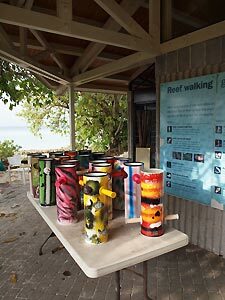 The resort provides reef walking shoes, balancing poles and, very importantly, Seascopes (large tubes with handles on the sides and a clear bottom) as these allow a view of the marine life without distortion of the water�s surface. Plenty of birds to look at too, even though the breeding season had not yet started. 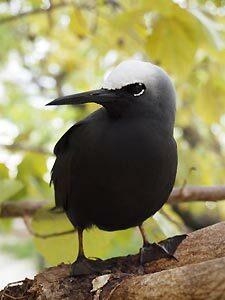 The Wedgetail Shearwaters, also called Mutton Birds, had not yet arrived, but the Noddy Terns could be seen in pretty m uch every tree, nodding their heads fervently when greeting each other. Apparently a the peak of� the bird breeding season there are about 150,000 birds nesting on the island! Our toddler thought the Buff-banded Rails were great! It took a bit of convincing that they were actually birds and not �little doggies� since they can�t fly. �None of the birds made us feel as if we were interrupting anything and seemed comfortable sharing their island with us humans. 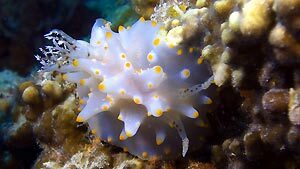 �One of the mornings, while Tim was diving, Max and I went to have a look under the water with the resort�s semi-submersible. Our one hour tour took us past the famous �Heron Bommie� . 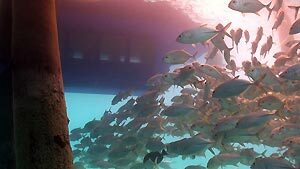 �Unlike a glass bottom boat it feels almost like you are part of the underwater scenery because of the different point-of-view. We saw quite a few turtles, lots of Cow-tail Rays, plenty of different species of staghorn corals and of course fish. 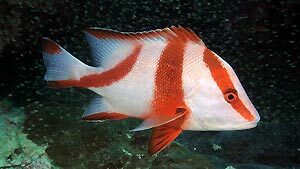 We kept a keen eye out for �Nemo� or �Dory�, and although we didn�t get to see them we saw a lot of other fish such as schools of fusiliers, trumpetfish, parrotfish and a variety of surgeonfish and butterflyfish. �The turtle egg-laying and hatching season must be great to witness. 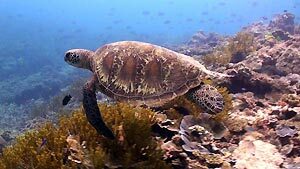 Both Loggerhead and Green Turtles nest on Heron Island. In November the females start coming on land at night to find a suitable nesting beach. Once they have decided on a good spot they�ll come back several nights to lay different clutches. Then from January onwards hatchlings emerge from the sand, making their way to the ocean. Despite a �busy� schedule I managed to spend some time at the Aqua Soul Spa where I received the Total Wellbeing Treatment. It was a shame they didn�t have any options specifically for pregnant women, but the wonderful staff managed very well to make slight adaptations and I felt ultra-relaxed afterwards. 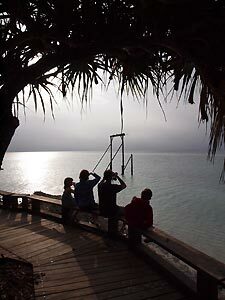 �For families with older children Junior Rangers offers a great opportunity for children 7 � 12 years of age to learn more about the natural surroundings on Heron Island. Under the supervision of an expert guide the kids get to enjoy hands on activities and explore the island�s reefs, coral cay forest and woodlands. Definitely something I would encourage my child to participate in, not in the least as some of the parents probably learned a great deal as well. And the meal times are just brilliant. Both breakfast and lunch offer plenty of food � buffet style. Although our little man is not a fussy eater it was nice to be able to pick out the bits that he�ll definitely eat and are fairly healthy � I would then collect my goodies and end up sharing that with him. And can I say that it is wonderful to, as a pregnant woman, approach the buffet. You see the other guests look at you twice and then subtly, but quickly side-step to let you through. No need to feel embarrassed about having two different desserts either and pile a little extra on the plate �for your toddler� who seems to eat an incredible amount all of a sudden. Some of the evenings they had an a la carte menu for the adults and a small special buffet for the younger kids instead of a buffet. During the months November through until May turtle egg lying and hatching can be observed. Both Green Turtles and Loggerhead Turtles nest on the island. Photos at the Information Centre show people riding large adult turtles to the beach taken in the late 50s. Basically, staff would wait for the female turtles to finish laying their eggs for the night and quickly flip them on their backs. In the mornings they would collect the guests and tell them they could go for a ride! How times have changed indeed. The staff these days knows a lot about the environment and encourage people to take notice of their procedures that have been implemented to interfere on a minimal basis, only in order to learn more about the wild life of the island. We were very impressed with the great effort that has been taken to keep the island in its natural state without skimping on comfort. And last but not least I would like to mention the staff. We heard and read plenty of compliments about the Heron Island Resort staff and it is all true. Each and every staff member we got to meet was absolutely professional and super friendly. Knowing that they live on the island and therefore are at work pretty much 24/7 they did an excellent job looking after us and all the other guests. No grumpy faces, understanding and happy to help wherever they could to make your stay pleasant. Outstanding!